With a history dating from 1571, Harrogate Spring is Britain’s oldest bottled water and has been revered by Royalty and enjoyed across the world for centuries. First bottled in 1740, it is ‘The Original British Bottled Water’ from ‘The Original British Spa Town’ – authentically Harrogate and quintessentially British. Following discovery of the mineral springs in the 16th century, Queen Elizabeth I’s personal physician recommended their medicinal properties and Harrogate was christened ‘The English Spa.’ Wealthy visitors travelled to ‘take the mineral rich waters’ and Harrogate became a popular health destination. We operate with respect and integrity to ensure that the environment, our people, and the Harrogate Spring Water community are at the heart of all that we do. Today, we are one of the UK’s largest independent, family-owned producers of naturally sourced bottled water. We are proud to continue a rich heritage, one that has shaped and continues to shape our beautiful town. Committed to healthy hydration, we continue to produce the world’s finest naturally sourced water from the original British spa town, for all to enjoy. We are proud to be Britain’s No.1 premium water brand, the No.1 bottled water brand in foodservice and the fastest growing bottled water brand in Britain. Harrogate is internationally renowned and respected, multi-award winning and voted ‘The World’s Finest Sparkling Water’. At Harrogate we’ve always done things differently. We’ve enjoyed breaking the mould and setting the trend. Our recognisable black and white branding is distinctively ‘Harrogate’; providing exceptional stand-out and timeless elegance. Our award-winning iconic ‘diamond bottle’ has been inspired by the town’s beautiful architecture. The sparkles emphasise the purity of our water and help express the originality of our products. The classic styling and typography date from Harrogate’s refined heyday. Harrogate is holder of numerous prestigious design awards, including; DBA Design Effectiveness Award – Gold, UK Packaging Awards – Winner, BBI Awards – Gold. Found at the most prestigious events and venues, from Michelin-starred restaurants to onboard the world’s most reputable airlines. Customers include iconic institutions such The Royal Albert Hall, Tate Modern and the National Trust. 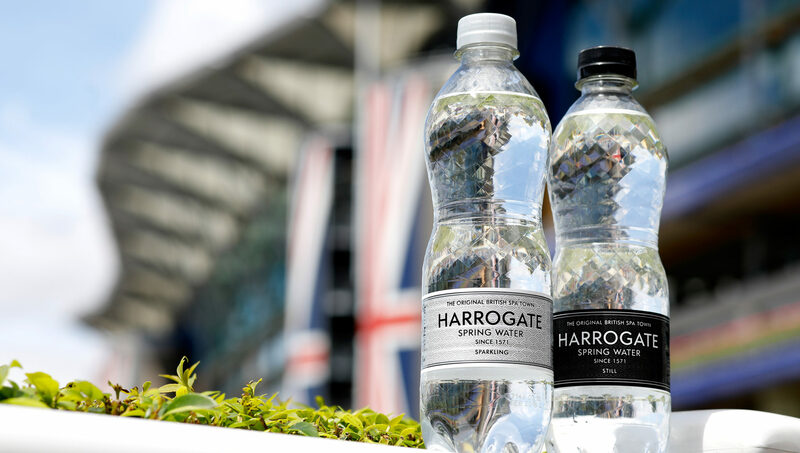 Harrogate is the official bottled water of Royal Ascot, one of the most celebrated international social and sporting occasions, as well as the exclusive water partner of Keep Britain Tidy.